Last week I was invited to attend a holiday gala for the Indiana chapter of the American Society of Interior Designers. 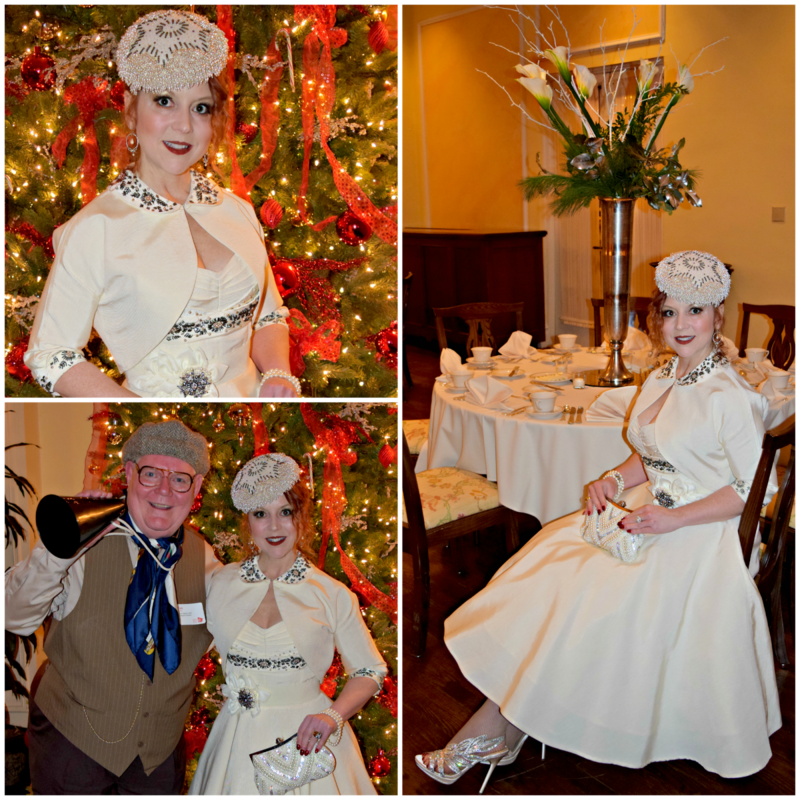 The theme was "Silver Belles of the Silver Screen: An Old Hollywood Holiday Celebration." 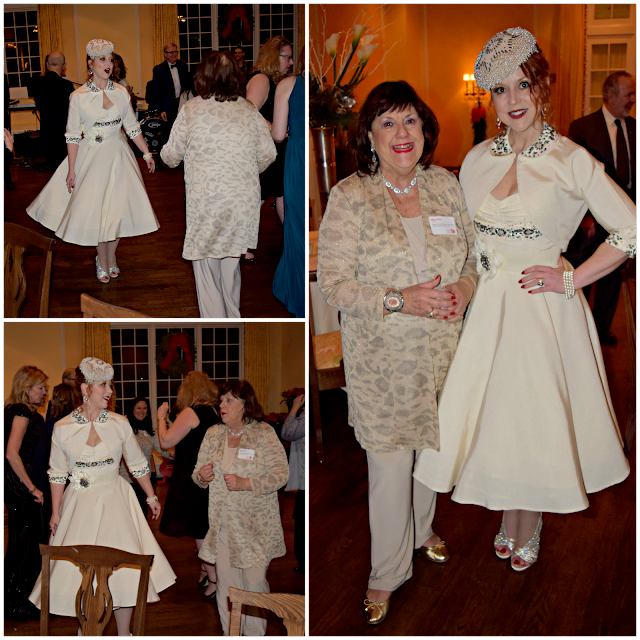 If you follow Red's Shoe Diaries at all, you know I am all about a theme party, and it was the perfect occasion to wear one of my favorite vintage 1950s hats and a dream dress from retro designer Candice Gwinn. I found the ivory faille dress in an online sale last Summer and had to have it. The full skirt, pleated bustline, detailed beading, and matching bolero (so prevalent in the 1950s) truly evoke vintage Hollywood style. The only problem - the dress was a few inches too big through the bodice. This might not have been a big deal save for the low cut of the dress. The jacket, on the other hand, was a tad snug in the arms, which would have significantly inhibited my ability to dance the night away (and with a dress that swirls and twirls so well, dancing the night away is an absolute must). The full, twirly girl skirt on this dress had me spinning 'til I was dizzy on the dance floor. I've said it before, but the most beautiful dress in the world is ruined by a poor fit; and even the simplest frock can look exquisite when perfectly tailored for the woman wearing it. As much as I loved this dress, it simply did not look the way I wanted it to look...until I found my very own holiday Angel. I'm not speaking metaphorically here. An Angel literally came to my rescue and helped bring my Old Hollywood Holiday vision to life. 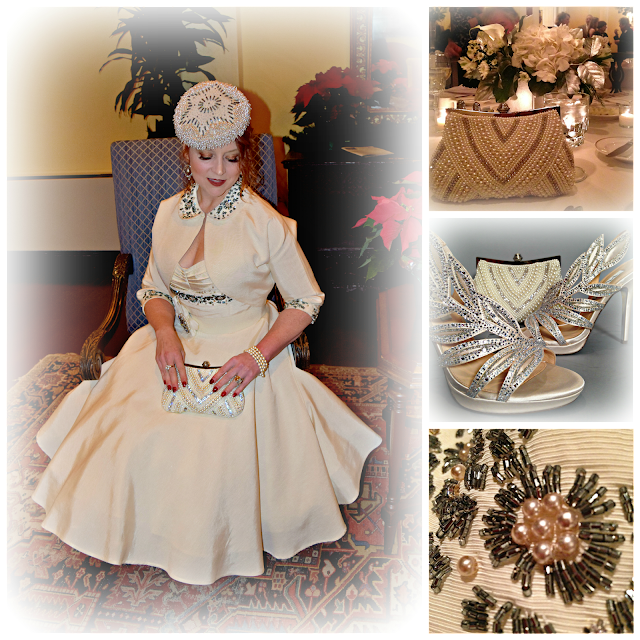 This vintage 1950s hat looks like it was custom designed for the dress, but they were created more than 50 years apart. For more great hats, check out Style Crone's Hat Attack. I'm talking about Puerto Rican born, Indianapolis basedcouture designer Angel Olivera. I met Angel at a fashion show in the Fall, and we bonded instantly over a shared passion for vintage silhouettes and fine tailoring. Though humble when asked about his history, Angel is an experienced, award-winning designer whose custom creations have graced Miss Universe and Miss World contestants. To my great delight and benefit, he made Indianapolis his home base several years ago, where he continues to design couture garments and rework existing garments into beautiful, new creations. It is thanks to his fine work that I felt like I stepped out in a dress from the set of my very own White Christmas. If you're interested in working with Angel, you can reach him through his website, which also includes a beautiful gallery of his couture creations. Both the decor and the guests channeled the Silver Screen theme of the Silver Belles gala. 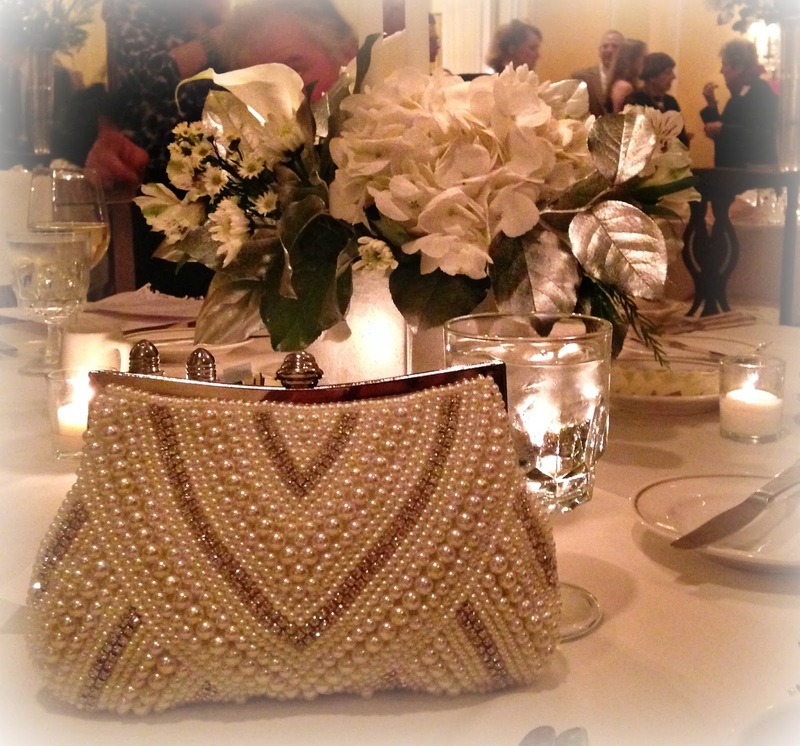 This pretty little pearl and rhinestone clutch looks vintage, but can be found here at Charming Charlie! Jody, you look so glamorous! You absolutely look like you belong on a Hollywood set. Thank you so much for sharing your breathtaking headwear with Hat Attack! There is Magic in You!